A historic church with an uncertain future. The Russell Street Church, located in 819 and 901 Russell Street, first opened its doors in 1905. The Russell Street Church of Christ was one of the most influential churches in East Nashville, and its members were influential in establishing many other prominent East Nashville houses of worship, including the Madison Church of Christ. Its sanctuary was used as a hospital for the sick during the 1918 flu pandemic. In 1998, the structure was severely damaged by the tornado that ripped through much of Nashville’s east side. The church’s congregation was unable to pay for repairs and took to meeting in member’s homes. The remaining damage is evident when looking at the structure. If one looks up the walls of the Russel Street Church, one can see small trees growing out of the spaces between the building’s bricks. The congregation sold their structure to a local real estate developer in 1998, and the structure has sat empty since. 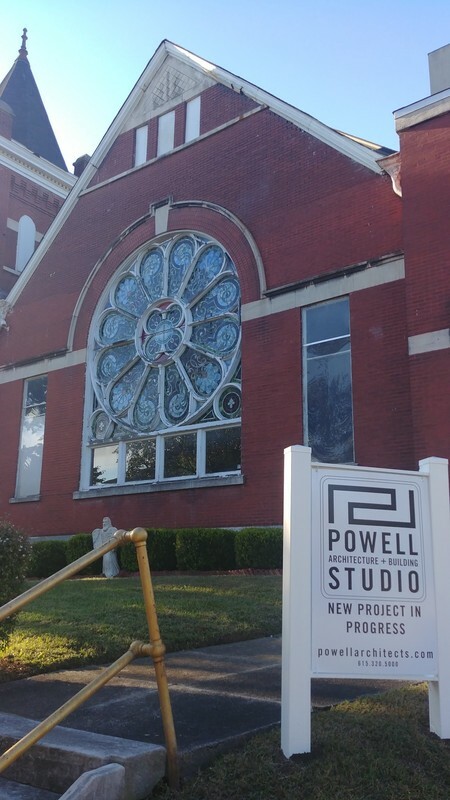 The Russell Street Church building was recently bought by Powell Architecture and Design Studio, a boutique architecture firm based in west Nashville, for $1.9 million. The company has been extremely influential in shaping the visual profile of the East Nashville resurgence, designing the interiors the nearby Butcher and Bee, as well as several local breweries. The company is currently gutting the structure; as you can see though the side-door on 19th street. There are plans to turn the space into a boutique hotel. Olivia Pugh, “Russell Street Church,” Bygone Nashville, accessed April 25, 2019, https://bygone-nashville.mtsu.edu/items/show/38. Carey, Bill. "Russell Street Church R.I.P." Nashville Scene, June 21, 2001. Accessed November 29, 2018. https://www.nashvillescene.com/news/article/13005888/russell-street-church-rip. Williams, William. "East Nashville Church Building Eyed for Hotel." Nashville Post, April 17, 2018. Accessed November 29, 2018. https://www.nashvillepost.com/business/development/article/21001180/east-nashville-church-building-eyed-for-hotel. Published on Nov 29, 2018. Last updated on Dec 5, 2018.